INKin' All Night! 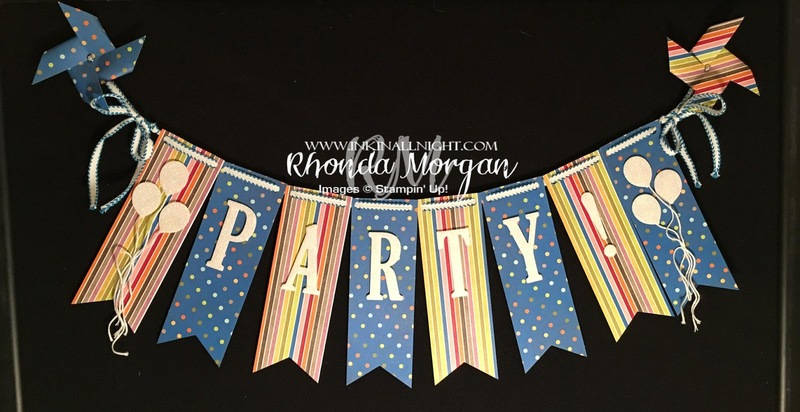 : It's a PARTY, welcome banner! Today I'll share with you the start of the Birthday Memories Product Suite Class idea that I put together for the April, On Stage event in San Diego. As part of the Global Events Council our presentation outline was designed to include a business strategy featuring the product suite that we were assigned. Basically to share an idea of how I would or other demonstrators could incorporate this into their business. So I think what will make sense is to share the samples that I designed first and then to share the business strategy afterwards, if you are interested! I know we are all here for the pretty things, but if you are a demonstrator you can put the cuteness and usefulness to work for you and treat your guests to a great stamping experience as well! So ... Birthday Memories ... it seemed to me like a birthday party was a perfect idea! So I planned out several projects and by the end you'll see you have the basics of everything you'll need! So let's Party! This banner can be used on the door to welcome your guests and let them know they're at the right house! It could also be used as a center piece at a table - just attach paper straws to the pinwheels on the end and then insert into decorative glass jars, floral vases or even with skewers inside the paper straws right into the birthday cake itself! 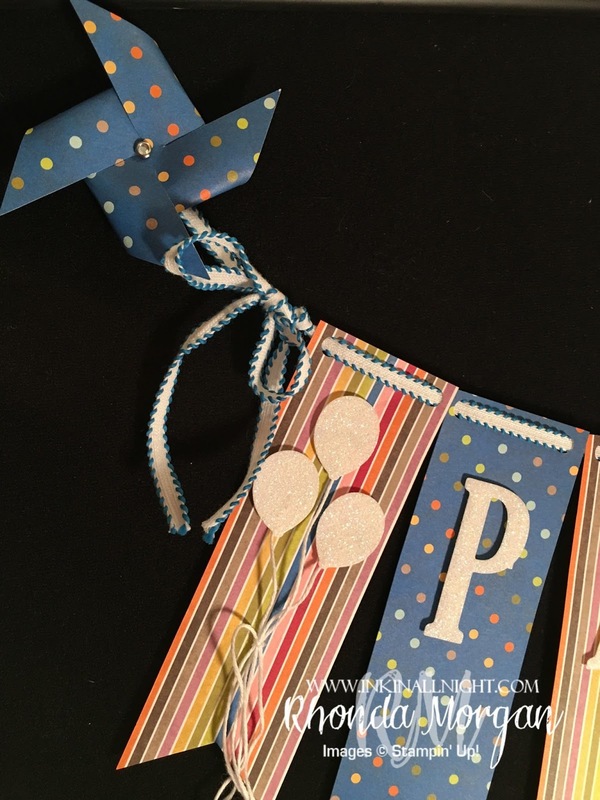 I used the polka dots and stripes sides of the designer series paper (dsp) and just alternated by 2" x 6" strips. I created the flag tails with the Triple Banner Punch, and used the hand-held punch to punch holes in the corners of the top edge to thread the Pacific Point new ribbon through! I chose to thread it so the ribbon showed on the top of the banner strip (vs if you threaded it the other way it would have been behind the paper). I used separate pieces of the ribbon to tie on bows at each end. 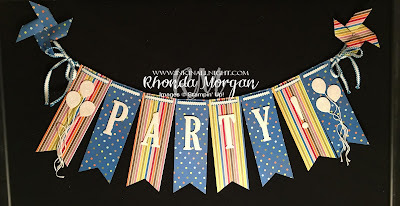 I used the Dazzling Details Glimmer Paper to cut out my PARTY! with the Large Alphabet Framelits - super easy if you peel off the light backing layer behind the glimmer paper. It's almost as thin as a small layer of film, it just sort of peels off. Then I punched some balloons as I was only sent a small sampling of the Honeycomb Crepe Balloon shapes to work with. You could easily order those and include them as part of the class fee and then your balloons could be 1 of each color on each end and be puffy and add another layer of texture and fabulousness!! 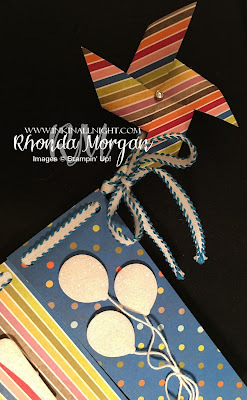 The pinwheels are so simple, you can just cut a piece of dsp into a square, use a push pin to pierce the center of the square and then you cut from each corner towards the center stopping with 1/4-1/2". Pierce the same corner of each of the four corners and then you insert a brad or something similar and bring one corner up to the center at a time, working your way around the pinwheel until all four corners are attached to the brad! Super simple, google it and you can find very easy to follow tutorials. The balloons can be cut using the Birthday Memories framelits or with the balloon punch. I used white bakers twine, kind of curling it by pulling it against the edge of my bone folder. Used a separate smaller piece to tie the loose balloon strings together and just let the extra tails hang down. Use LOTS of DIMENSIONALS on this banner! It really gives it some POP and Glimmer and it's super cute and really not that hard at all! Hope you enjoyed the PARTY banner!